Lady is a mare that presented for acupuncture treatments to elevate her level of athletic performance associated with her barrel racing career. Three acupuncture treatments were preformed over one month time. The owner’s impression of the treatments was favorable and she will continue to see how well she does over this summer’s barrel racing season. Lady is a 17 year old Quarter Horse mare. She is used for pleasure riding, as a working cow horse and occasionally Nicole likes to run barrels with Lady. She had surgery to remove a bone chip from her right front carpus prior to Nicole purchasing her. She also sustained a laceration to the heel bulb on her left front hoof in 2017. The owners goal for this horse is to use her more in barrel racing competition. She is concerned about how her right front knee will handle an increased work load. In April 2018, Lady presented to me for routing teeth float and her first acupuncture (AP) treatment. 4-11-18: Lady was bright, alert and responsive. Her heart and lungs auscultated normal. Her gut sounds were normal and she was apparently healthy. Neurologic exam was normal. She had some dental pain, reactive to ST 7, and had sharp points on her molars that corresponded to ulcers on her gums. Motion palpation exam showed sensitivity over poll and muscles over her atlas and around her nucal ligament. She also had muscle sensitivity over her lumbar vertebrae. 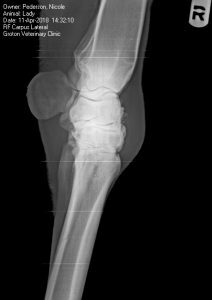 There was decreased range of motion (ROM) in her right front carpus and she had some thickening to joint capsule on the medial side. X rays were taken of her knee and showed osteoarthritis at the medial surface of the intercarpal joint. No bloodwork was preformed and xrays were not taken of her cervical or lumbar vertebrae. Since her teeth were a primary concern, Lady was sedated for a dental. Sharp points on her molars were reduced to establish correct molar occlusion and allow for healing of her oral ulcers. The owner was also a little concerned about how Lady would respond to AP treatments and needle placement. So we decided to perform her first AP treatment while she was still a little sedated from the dental. We decided to try 3 AP treatments over the course of a few weeks to see how she would respond. Our goal was to maintain the highest level of athletic performance without the need for bute or other oral anti-inflammatories. The acupuncture treatments were focused on stimulating her central and peripheral nervous system and reducing inflammation and pain in Lady’s right front leg and along her lumbar area. Chiropractic adjustments and vertebral subluxations were address as needed. PC 6 was used to stimulate the median nerve. LI 10 was used to stimulate the radial nerve and for local pain. TH 17 was used for dental pain and TMJ pain. ST36 was used to provide overall parasympathetic stimulation and stimulate the fibular nerve. Other AP points, such as GV 14, GV 20, BaiHui, GB 21, LI 16 were used to stimulate the parasympathetic nervous system and promote relaxation and calming. Points along Lady’s bladder line were used to relieve muscle tension and for local trigger points. Multiple diagnoses were made on initial presentation. Oral ulcers and sharp points on her molars caused dental pain and likely TMJ and neck pain. 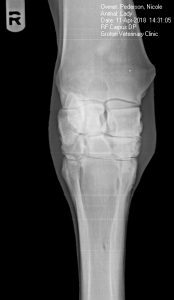 Lady’s x-rays were consistent with osteoarthritis in her inter-carpal joint on her right front carpus. Three AP treatments were preformed on the following days. For the first treatment, Lady was still a little sedated from the dental that was preformed on this day. Right leg only: LI 10, PC 6. Blue Seirins 0.20mm diameter, 30mm long were used. Points were bilateral unless on midline or otherwise specified. For the second AP treatment Lady was not sedated. Myfascial palpation showed decrease ROM on left side of neck and muscle sensitivity over splenius muscle and brachicephalic muscle. Chiropractic adjustments were performed prior to the AP. For the third treatment Lady was not sedated. Myofascial palpation showed that she had decreased ROM on the left side of her neck and muscle sensitivity over the splenius muscle and brachiocephalic muscle. She was also reactive to PC 1 on the right side but not on the left side. This corresponds to the pain in her right leg from her previous knee surgery. Right side only: PC 1, LI 10, PC 6. Lady responded well to her AP treatments. After the second treatment the owner was impressed with how well she relaxed and seemed very content during the treatment. The owner’s impression of her was that she moved better under saddle and seemed to stride out better after treatments. Lady consistently showed decreased ROM and stiffness on the left side of her neck. In the future it may be worth taking cervical xrays or performing ultrasound of the facet joints on her cervical vertebrae. We did not pursue this at this time, but we do not have a reason for the stiffness other than possibly compensating for the pain in her right front carpus.